With container gardening it’s easy to be adventurous even if you have just a few square feet of patio, deck, balcony or rooftop. And because plantings can be changed with the seasons, pots, hanging baskets and window boxes encourage originality. You can really have fun with containers, trying out brash combos with interesting and exotic plants. 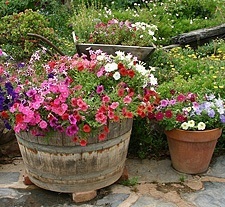 When container gardening, tailor your plantings to available light. In low light, use shade-tolerant plants with lush foliage – consider hosta, heuchera, ivy, coleus and licorice plant (Helichrysum petiolare). Remember that the scale outdoors demands bigger gestures, so plant up the largest pots you can afford. One large container is better than five small ones. An easy way to go at it is to feature three focal-point plants per pot and then add filler plants around them. Plant in odd numbers for the most pleasing arrangement. When grouping containers, they don’t all have to be the same shape or contain the same plants, but try to include one element that ties the picture together, such as a particularly distinctive plant repeated in each pot, or choose pots of the same material and color. Try not to mix styles in the same grouping of pots. Terra cotta tends to be more casual, while stone and cast iron are formal. So keep these container types separate, perhaps a pair of formal stone urns at the front door and a casual grouping in clay on patio. Any pot you use must have a drainage hole. Think foliage as well as flowers. Time-tested foliage combinations are larger leaves set against filigreed foliage. Try growing herbs in containers or even vegetables. Try using perennials in containers. Hostas, hens and chicks (Sempervivum species) or small standard roses add an air of sophistication to containers. In fall, remove perennials from containers and plant into a flowerbed. Container plants won’t thrive without fertilizer. If you find this job too time-consuming, there’s an easy way to do it: just mix slow-release fertilizer pellets into top layer of potting soil. As you water throughout the season, controlled amounts of fertilizer are released each time. Daily watering is a must during the hot months of summer, so arrange your pots into groups and instal an easy-maintenance drip patio irrigation system that can water them automatically. Another watering solution is self-watering containers which have a water reservoir built in so you don’t have to water daily. You can also fit your container with an adjustable water reservoir to convert an ordinary pot into a self-watering planter. In last fall, empty pots that aren’t frost-proof of their contents, including potting mix, and store them in a dry place such as a garage, garden shed or basement.